It was another double-podium for the Rockstar Energy Factory Racing Team on Sunday for Round 3 of the 2019 AMA Grand National Cross Country (GNCC) Series in Morganton, North Carolina as Thad DuVall and Trevor Bollinger finished first and third, respectively, at the Steele Creek GNCC. DuVall’s victory marks his first of the season as he continues to vie for his first-ever GNCC Overall National Championship in 2019. 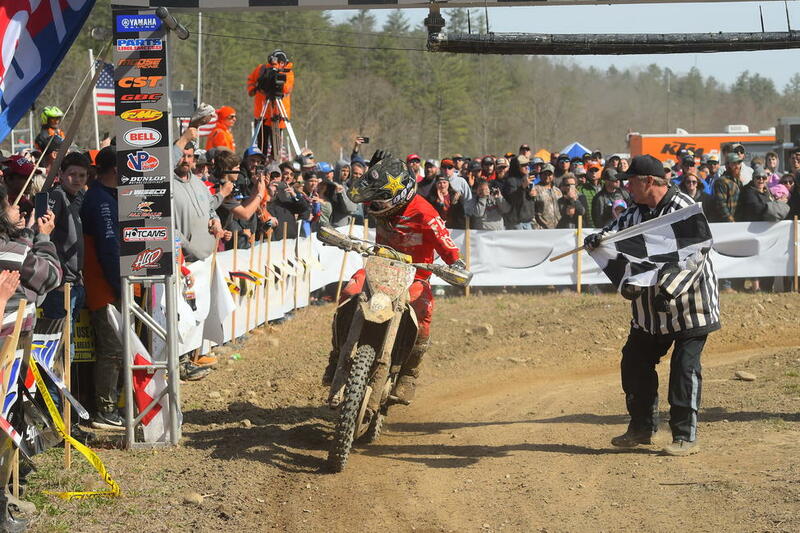 As the green flag flew for the XC1 Open Pro class, DuVall put his FX 350 into second place, where he immediately began battling for the lead position. With his teammate Bollinger close in tow, DuVall continued to dice back-and-forth in a three-way battle with Kailub Russell, and he took over the reins around the halfway point. Coming into the final lap, DuVall sat in second until he came upon Russell stuck in a newly-formed mud hole. DuVall made the choice to take a new line and bypass the chaos, thus moving his way into the lead spot. From there, DuVall remained steady as he claimed his first victory of the season at Round 3. Bollinger, too, interjected himself into the lead battle right away as he powered his FX 450 to a third-place position off the start. He bounced around between third and first, taking over the lead a couple times throughout the seven-lap race. He maintained close proximity to the two front-runners heading into the final lap but the mud hole chaos ultimately set him back, where he finished 32 seconds back for third overall. Husqvarna Motorcycles-supported, Rockstar Energy athlete, Tayla Jones, returned to the center of the podium on Sunday with a victory in the WXC class.